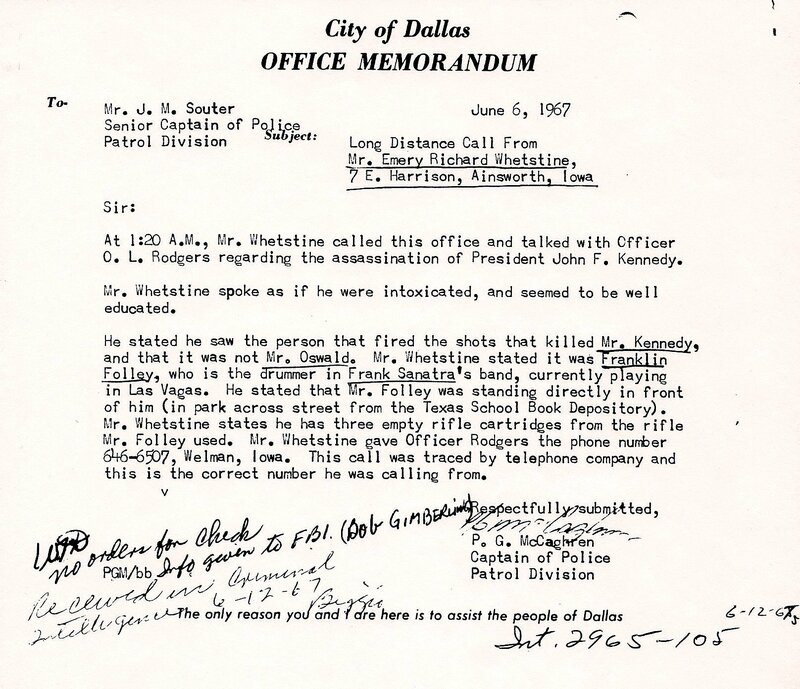 In what appears to be, outside of the Oswald police report on the Kennedy assassination, the only other true police report filed with the Dallas Police Department - Emery Whetstine claims he was standing on the Dealey Plaza infield with Franklin Folley when Folley shot John F. Kennedy with a rifle. Of course the police department did not take Whetstine's claim seriously although they did check the phone number. Ainsworth, Iowa is a small town located about 53 miles southwest of Davenport. There is no East Harrison Avenue, Road, or Street. There is a East Harrison Street in Washington, Iowa about 7 miles to the west. Wellman, Iowa is located 14 miles north north west of Washington. There is no East Harrison Avenue, Road, or Street in Wellman. The 1930 United States Census shows a Emery Whetstine (age 3) son of Lloyd and Lulu Whetstine residing in Wellman, Iowa. If that is the correct person he would have been 40 in 1967. The phone number given by Whetstine and traced by the telephone company is in use today. Whetstine's report says Folley was the drummer in Frank Sinatra's band on the date of the report - June 6, 1967. There is no evidence Frank Sinatra had his own band. He did join the Harry James Band in 1939. The band's drummers were Harry James and Buddy Rich. Sinatra joined the Tommy Dorsey Band in 1940. Dorsey's drummers were Buddy Rich, Ray McKinley, and Spike Jones. Sinatra had left both bands by 1942 a full 20 years before the assassination. In early 1967 Sinatra was involved in creating a studio recording in partnership with Brazilian songwriter Antonio Carlos Jobim. Later that year Sinatra was involved with acting in two movies - The Naked Runner [filmed in England and Germany and released in July of 1967] and Tony Rome [released in November 1967]. It appears Whetstine's allegations are the ramblings of a drunk.